The Bailey Pegasus 534 is the company’s best selling layout in the ground breaking Pegasus range, just as it predicted! Liz and Dave King took one for an extended live-in test. Based on the popular Senator Series 6 California layout, with a fixed nearside double bed, the Pegasus 534 just has that bit more pizzazz, like the 35cms wide front window shelf, the flashy grab handles and easy-to-wipe down GRP interior walls which reflect the light. Interior lighting is largely thanks to LED 12V lighting set under the floating fascia overhead lockers. Our only criticism of the lighting is that it needs a bit more over the surface in the kitchen. The off-side kitchen has a new style rectangular stainless steel sink with a decent sized washing-up bowl and an over-sink chopping board. We liked the little cut out on the edge of the board and the four small recesses on the under surface of the board that fit over little rubber up stands on the sink which keep the board in place, even under tow; the gas hob, grill and oven are complemented by a microwave oven. Combined with a pull–out storage basket and upper locker storage, what more could the chef want? The end washroom has a decent sized fully lined square shower cubicle with a bi-fold door and it’s easy to wipe it dry after use. The large mirror helps make the room feel bigger than it is and the lack of storage space is made up for with a large wardrobe and plenty of overhead lockers in the bedroom area. The design of the lift-up front bed boxes gives easy access to the ground level storage area and incorporates foot rests. Oh yes, we found they made bed making much easier too. Pegasus sales now account for over 65% of retail sales and in the light of that galloping success Bailey has now ceased production of its Senator range Series 6; Pegasus has become the top-of-the-range model in the company’s portfolio and we can see why the Pegasus 534 is the best selling model. 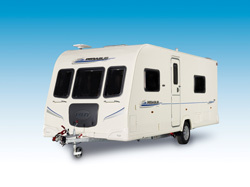 *Caravan insurance cost based on 2010 Bailey Pegasus valued at £16,845, fitted with hitchlock, AL-KO axle wheel lock, ATC trailer control, Tracker alarm and Tracker Monitor tracking system (standard on this model). Kept on drive at HX4 0BE. Caravanners over 30 years old, claim free for 3 years and a member of a caravanning club. Premium includes insurance premium tax at 5% and is correct as of 12.05.10.